Description: The Battle of Carlisle was a relatively small, but strategically important skirmish during the Gettysburg Campaign. The Battle of Carlisle was the reason why Confederate cavalry under Maj. Gen. J.E.B. 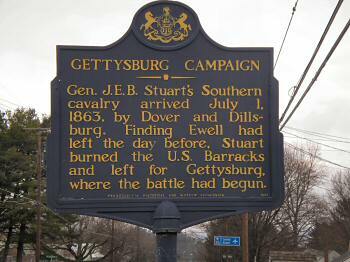 Stuart did not arrive at the Battle of Gettysburg until the second day of fighting. His failure to rejoin the Army of Northern Virginia earlier was a source of annoyance and concern to Gen. Robert E. Lee, who missed the "eyes and ears" of his army as he engaged the Army of the Potomac. Stuart, on a lengthy roundabout ride to locate Lee's army, briefly engaged Union militia under Maj. Gen. William F. "Baldy" Smith at Carlisle, and then set fire to the famed Carlisle Barracks military outpost before withdrawing towards Gettysburg. The borough of Carlisle, located in the Cumberland Valley and close to the state capital of Harrisburg, had been occupied by Confederate troops of Lt. Gen. Richard S. Ewell's Second Corps of the Army of Northern Virginia a few days earlier. On June 27, 1863, Ewell stopped at Carlisle en route to Harrisburg and requisitioned supplies, forage, and food from the populace (prior to the Civil War, as United States Army officers, Ewell and some of his staff had been stationed at Carlisle). So Ewell paused in Carlisle while ordering his cavalry, under Brig. Gen. Albert G. Jenkins, towards the Susquehanna River and Harrisburg. After resting much of his infantry overnight, Ewell moved northward in his quest to seize the state capital. After the Confederates left in response to an order from Lee to concentrate near Gettysburg, Carlisle had been reoccupied by Baldy Smith and a small contingent of New York and Pennsylvania militia from the Department of the Susquehanna, dispatched by the department commander, Maj. Gen. Darius N. Couch. The 32nd and 33rd Pennsylvania Volunteer Militia, Landis's Philadelphia militia artillery battery, and a company of the 1st New York Cavalry formed Smith's force. During the early evening of July 1, Stuart led two brigades of cavalry, at the end of their raid into Maryland and Pennsylvania, to Carlisle to look for supplies and to attempt to ascertain the whereabouts of Ewell's troops. A third brigade, under Wade Hampton, remained behind in York County to guard a train of 125 captured Federal supply wagons. Instead of finding Ewell, Stuart encountered Smith's militiamen. Despite having a large numerical advantage, Stuart's troopers were too exhausted from a month of campaigning to attack the town outright, and Stuart initially feared that the enemy troops were veterans from the Army of the Potomac. After learning that Smith's men were only militia, Stuart sent Maj. Gen. Fitzhugh Lee into Carlisle with a white flag, telling Smith to either evacuate the town or clear out the women and children. Smith replied that he had already done the latter, and refused to surrender. Stuart's horse artillery then began bombarding the town. After about an hour of shelling, Stuart received word that fighting had broken out to the southwest at Gettysburg between the main armies. Unable to take the town by force, Stuart disengaged, ordering the Carlisle Barracks to be set on fire by his men, and then began to move towards the fighting at Gettysburg. Casualties for both sides were minimal, with eight Confederate casualties, and one Federal killed and a dozen wounded. Besides the Barracks, a lumber yard and the local gas works were destroyed. 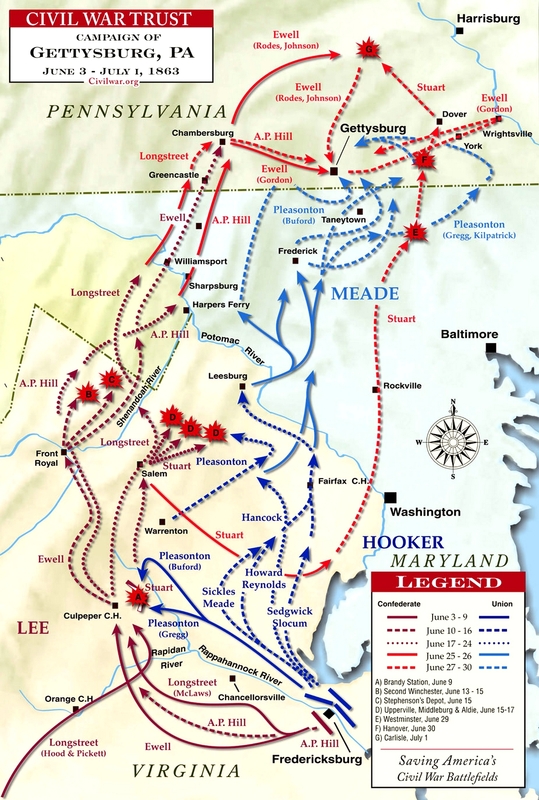 However, Stuart's delay at Carlisle impacted his ability to rendezvous with Lee's main army. Sources: Boatner III, Lt. Col. Mark M., The Civil War Dictionary, Van Rees Press, New York, 1959; Official Records of the Union and Confederate Armies; National Park Service.